Smartphone And Tablet Screen Time: Good Or Bad For Kids? - I Am Proud Of My Kids! Smartphone And Tablet Screen Time: Good Or Bad For Kids? Tablets and smartphones are great gadgets for making kids busy and quiet, especially for harassed parents who has more urgent things to do than attending to their kids. They can also be a great bribery tool. Parents use it to make kids behave, sit quietly in a car ride, get into a stroller, or even go into the potty. But there are some parenting experts who say that using screen time as bribery or enticements may have trade-offs. Parenting gurus, psychologists and even advice columnists are wary about the effects of iPads, iPhones, Androids and other gadgets with touchscreen on children under 3 who use them. They believe that screen time may have a negative effect on children’s developing brain. But the tendency to be alarmist usually happens when a new form of media becomes popular with children. When video games came out, pundits are afraid that these might make kids violent, and TV was once blamed for harming kids’ visions. But are worries about touchscreens warranted? What could possibly be the bad effects of young children playing with tablets and smartphones? Or does it actually have benefits, contrary to the conventional wisdom of the experts? Because tablets and smartphones are still new, pediatric research still do not have a lot of data to make a clear and consistent stand on the issue. Also note that some experts combine watching TV with interactive smartphone and tablet play as screen time. They are different, as watching TV is a much more passive activity than playing with touch screens. During the child’s first years, his brain develops rapidly, and very young children learn best by interacting with people, not screens. Being head down and having no eye contact with people might be harmful to their brain development. Screens distract one or two year olds from interacting with parents, siblings and other kids. Dan Siegel of Mindful Awareness Research Center thinks this may impede language, social and emotional development. It may affect children’s development of insights, empathy, ways of knowing themselves, and connecting with relationships. Also, toddlers need to be active physically. They should be actively exploring their environment, and not sedentary, getting almost all of stimulations from screen, and not building their bodies through physical play. This is why the American Academy of Pediatrics (AAP) do not recommend screen time for kids younger than 2. Babies and toddlers learn better with materials they can touch, versus what they see on a screen. Exploring concepts in three dimensions is better than two dimensions for cognitive development. Studies suggest that children ages 3 to 5 whose parents read to them through electronic books had lower reading comprehension compared to physical books. Part of the reason is because the bells and whistles from books in electronic devices distract the kids and parents from focusing on the story. On the other hand, another study shows that 2-year-old learned words faster with an interactive app than one that is passive. Doctors are concerned that over-exposure to screen has an impact on attention span and concentration, as well as appetite control. Tablets and smart phones take time away from other activities. Older children should have more time with playing outdoors, reading, engaging in hobbies, or using their imagination with free play. 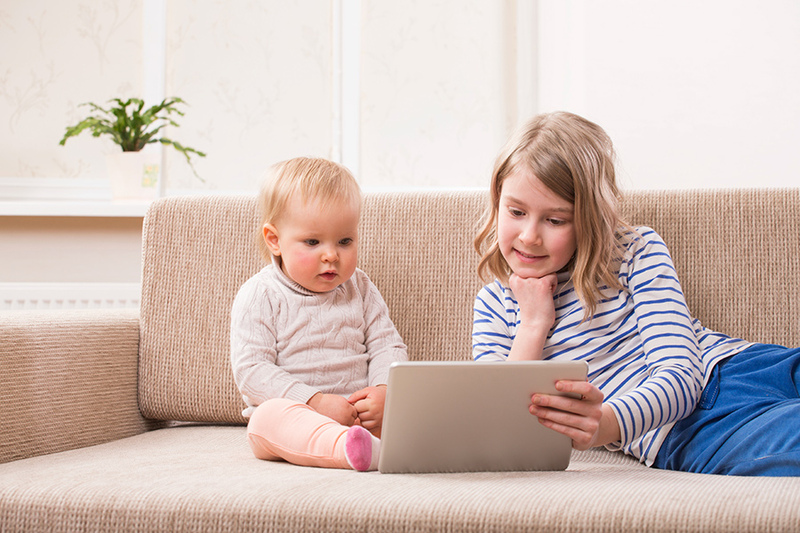 A 2014 study by UCLA’s Children’s Digital Media Center suggests that when screen time limits face-to-face interaction, kids’ social skills may be negatively affected, and this may blind them from understanding the emotions of other people. Social and emotional intelligence are critical to success in life. According to Catherine Steiner-Adair, a Harvard-affiliated clinical psychologist, children “need time to daydream, deal with anxieties, process their thoughts and share them with parents, who can provide reassurance.” This is not what happens when children would rather play with tablets and smart phones while in a car ride. Low-achieving and low-income school kids are more vulnerable to screen distractions, according to a University of Texas study measuring students passing a compulsory end-of-term exam. On the other hand, high ability students are still able to concentrate with the presence of smartphones. Children who sleep near a “small screen” (typically a smartphone) average 20.6 fewer minutes of sleep every night. This may be caused by the high levels of blue light emitted by the screens which depletes melatonin, a hormone linked to circadian rhythm. The extra screen time at night are resetting their bodies’ clocks in a way that makes it difficult for them to sleep, especially if they are just entering or are in the early stages of puberty. This results in lack of sleep and insufficient rest. Kids develop an aptitude for technology, which is an important skill now and more so in the future. Technology will be a part of his school learning. It is reasonable for your kid to explore this world at an early age. Tablets and smart phones offer an opportunity for your child to learn and stimulate his mind in a fun way. Dr. Seuss’s ABC app, for example, looks great on the iPad, and sounds awesome too. Used in a quality way, screens can actually be used to promote babies’ cognitive and social development. Quality means being involved in your child’s use of screen, watching and talking about what he is seeing or doing. Tablets and smartphones are also tools for your child to communicate. Skyping or Facetiming with friends or relatives is a great use of screens. For teens, communicating via the screen to form online relationships is an important part of developing as an adolescent. For more details on the benefits of playing educational apps for babies and toddlers, click here. Use the build-in parental controls in the device, if present. It’s a good idea to set it high, and let your child go to you to adjust the restriction. This will be an opportunity for you to talk with him about what he is doing online. Never let your toddler be occupied with screens when they are outdoors. Don’t use screens as silencer or pacifier. Ebooks that read to your child should not give you a pass on your educational responsibility to him. Choose media that is geared towards children. Too much screen time means less time for other activities like actively playing with other children or reading. As in most things, moderation and balance is the key. If possible, limit your child’s screen time to educational material that can still be fun (here are some suggestions for educational apps for babies and toddler). A 2014 Cohen Children’s Medical Center of New York study examined infants 0-3 years old that used touch-screen devices to determine if their use was of any educational benefit to infants and toddlers. Thestudy showed that children who played non-educational games using touch-screen devices had lower verbal scores upon testing. For older kids, make them play apps that are educational yet fun and even make earning a game like Duolingo (for learning a foreign language), Khan Academy (videos for learning almost anything), or King of Math (learning math). Interactive media engages the brain more than passive media like TV. So if the alternative use of interactive screen time is watching TV, encourage your child to choose playing with the smartphone or tablet instead. The AAP prescribes entertainment screen time be limited to 2 hours a day for children ages 3 to 18. For 2 year olds or younger, note at all. However, the more important thing to be monitored than time is the kind and quality of content and your involvement with your child. Parents and children should work together to decide how much time screen time is ideal, and make good choices about what media to consume. Create rules for using smart phones and tablets – even if it’s generous – and make sure your child follows it. For example, one hour of reading or playing sports in exchange for one hour of screen, only one hour on school days or three hours on weekends, etc. Your child models your behavior. If he sees you using your iPhone or tablet too much, he will probably do the same thing. Also, show that your child is your priority over screens by spending more time with her, or by talking with her when she arrives after school. For teens, teach them or give them rules on appropriate online behavior. Encourage your child to socially interact with others not only digitally, but also outside the screen. Be the first to comment on "Smartphone And Tablet Screen Time: Good Or Bad For Kids?"